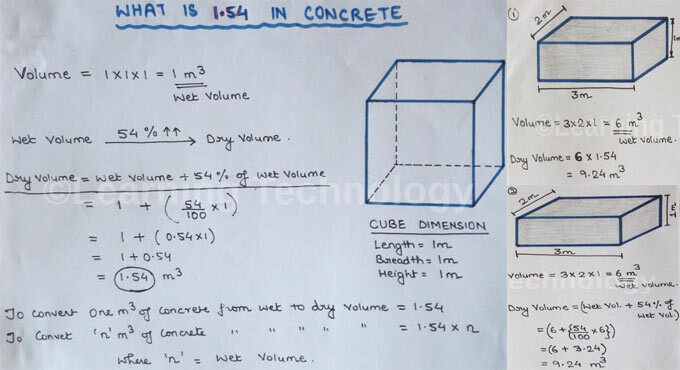 In this civil engineering video tutorial, you will learn how 1.54 in concrete is derived for measuring the quantities of sand, cement and aggregate as well as making calculation of wet volume to dry volume. It is the weight volume of the cube. The quantity of concrete is determined on the basis of dry volume. So, weight should be converted to dry volume. It is known that wet volume is increased to54% for being converted to dry volume. When the water is added to cement, the volume of cement is decreased and for this reason the wet volume is converted to dry volume. To view the graphical demonstration of the above theory, go through the following video tutorial.